Quite long time after original act of taxation disobedience in form of a food misuse in Boston harbor at 1773 other festivity takes place at Boston common. 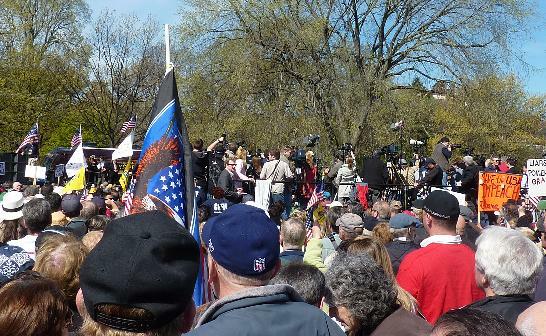 So named “Tea Party” movement held gathering main attraction of which was Sarah Palin, former vice president contender and controversial winker to all American. Boston is a good city with friendly population and limited number of maniacs on politically ground. The weather at Arp. 14 was spectacular just literally. The gathered about ten of about thousand of activists, bystanders, protesters to the act of protest, young democratic girls in uniform of Harry Potter coed-witches with broomstick and sign that Palin star Voldemort or something even more sophisticated. Impression about Tea Party message was not quite clear. Obviously Patriotic with militaristic scent. About freedom is not free and the price is sacrifice of sons of mothers. Other idea was about that normal people was told to do routine staff like to work hard and pay taxes but politicians conspire to cheat them in form of spending to bribe votes of paupers. Nothing surprising. A nice photo model like girl impersonated announcer in between boxing round with slogan: “Taxes for WAR not for Health Care”. Very clever pro-choice slogan. 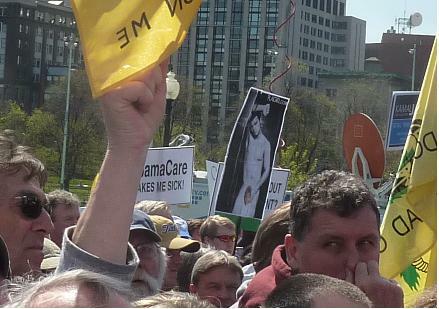 Anti Palin infiltrators were quite creative. Really liberal opposition if were noticeable at all, it target the celebrity starlet of right wing of political spectra, madam Palin. One promised to convert into lesbian if married officially with Sarah. Other had cartoon “Tina Fey 2012”, she, girl, was hashed and shy away by over serious tea activist. Most noticeable were ex-in-law expose with Her serving a fig-leaf for his maturity. 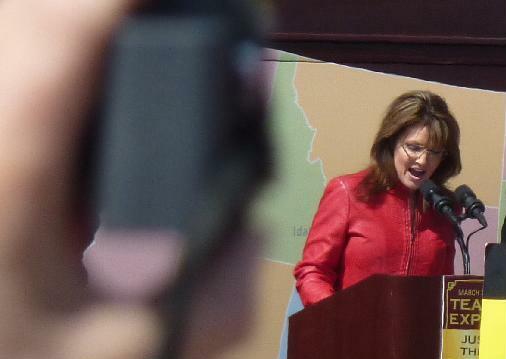 The speech of Palin impressed me not enough. High voice on the edge of children cry is always scandalous like, jokes are not funny, too far proximity from scene did not permit to be judge for physical. She remained me boy scout dream leader for late night musical. I expected Kankan but was given bo-oo-OOOO-o-oring stamp bla. The questing is why. Why did I expect anything out of scripted performance from this nice lady? There were not much politically incorrect signs. One of such stand alone to be offensive on many different levels. 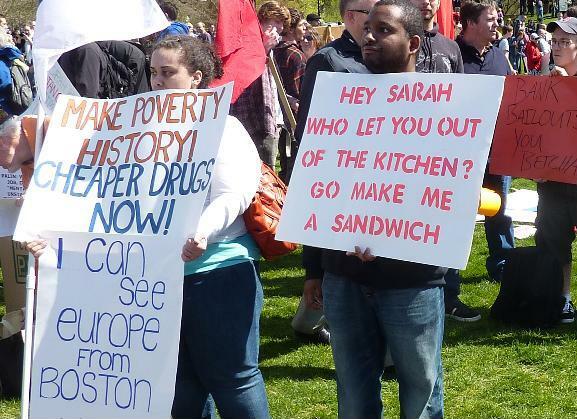 Black student rhetorically asked why Sarah is not on kitchen and not served him with sandwich… Anti-feminist black discriminate on ability of not too smart white house wife to govern state in the spite of liberal icon Lenin, who state that kitchen woman must to be able to lead nation. Bad thinking and acted stupidly. I give you big F allegorically. Official press corp are evil people. They erected artificial balcony bastion just affront of scene.
. What are they think about themselves? Are they independent journalists or active participants, destructors of natural flood of life? They just blocked good view from the center. For what legitimate purpose? Are they in real need to report any small movement on tribune? No. They could shift their bastion slightly back and had the same quality of picture. Politics of people and for people, HA! No! Small group in cooptation with press who shielded them from real peoples like Road Theater with embedded journalists. Fake movement, fake media, terrible times. Tea party became legitimate part of political process and lost many teeth, but was real alternative to extreme liberal madness.